Everybody back on topic. I need people to do two things. Dizzy - Stop being a martyr in your own eyes, people don't like your posting style, deal with it, don't complain because they make that clear. I'll see 5-6 posts in a row of people trying to get a thread back on the rails and then you post complaining about other posters, that doesn't help anyone. Everyone else - Stop poking Dizzy. He's staying on topic way better than before and not liking someone's posting style isn't justification for insults. Disagree all you want, but do it with class. Posting to "ignore it" isn't actually ignoring something, it's just being juvenile and I'm going to start handing out warnings, rules about insulting other posters don't disappear just because you find said poster annoying. Dizzy and Everyone - Stop with the innuendo. I'm sick of having to police individual innuendos and decide which are and aren't okay. This is supposed to be a family friendly site. All innuendos will be an automatic warning until we get out of the habit of pushing the line as far as we can go. Repeated innuendos after receiving a warning will be grounds for temporary bans. ok back on topic, what do folks think about King? Is he just a guy, or just someone that they are giving a look in the search to replace Davis? Guy was mega productive in college. I've heard great stuff, but didn't see him play in college at all. I thought that snap count someone posted of the Rams LBs last year, where two of them played like 1K snaps each and the 3rd guy (which was actually like 4 guys) played about 300 snaps. So I think that 3rd guy here will probably be similar, 3-4 different guys with different strengths and weaknesses. What is King's calling card? I am guessing there will be no replacement to Davis; his position is just being phased out. I'm not expecting much but a rotation guy from King, which is fine--anything more is icing on the cake. As the hijinks have essentially come to an end, I must say that it was an honor spooking you (and being spooked by you), Sir. The bottom line in Cleveland is that none of these players would be alternating first-team reps if the Browns possessed an unquestioned starter. That decades-long search continues, and it could stay that way deep into the regular season. Regarding Brock wanting to start, of course he does. He said it perfectly himself a few weeks ago. If you don't want to start you are in the wrong business. No one wants to stand on the sidelines. All I ever called for was for him to compete because physically he is the prototype, and he has experience, some good and some bad. Which he is competing, so thats good. Competition is what is needed. The whole debacle here just got out of hand. Yup. Fair points--just disagreement on how good/how bad. I hope I'm wrong & he is another piece for us. We're in bizarro world or something with all these positive articles on Browns QBs (along with mostly positive news going with Kessler as well). I have a feeling that one of these guys stands out enough this year to not be talking QB next year. Let's nip it in the bud. 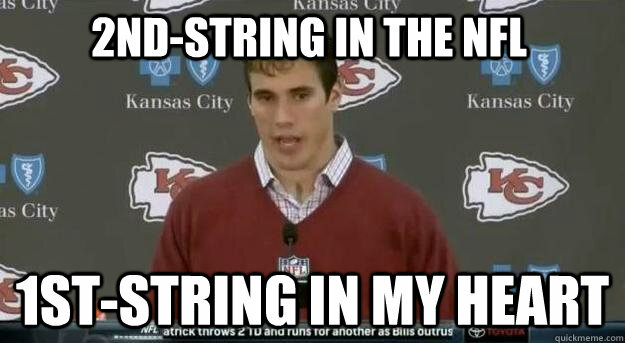 Brady Quinn or Derek Anderson!? You're about 8-9 years too late on this one Dizzy, unless you were here in a former life/username. Friendships were lost, users were banned (including moderators), and others left and never came back. I'm not joking and I'm not exaggerating. PFFTTTTT...go pound sand Bwick...DA would have been a HOF if he wasn't paranoid/looking over his shoulder. Plus, it's Braylon Dropwards and Kellen "Wheelie" Winslow's fault!